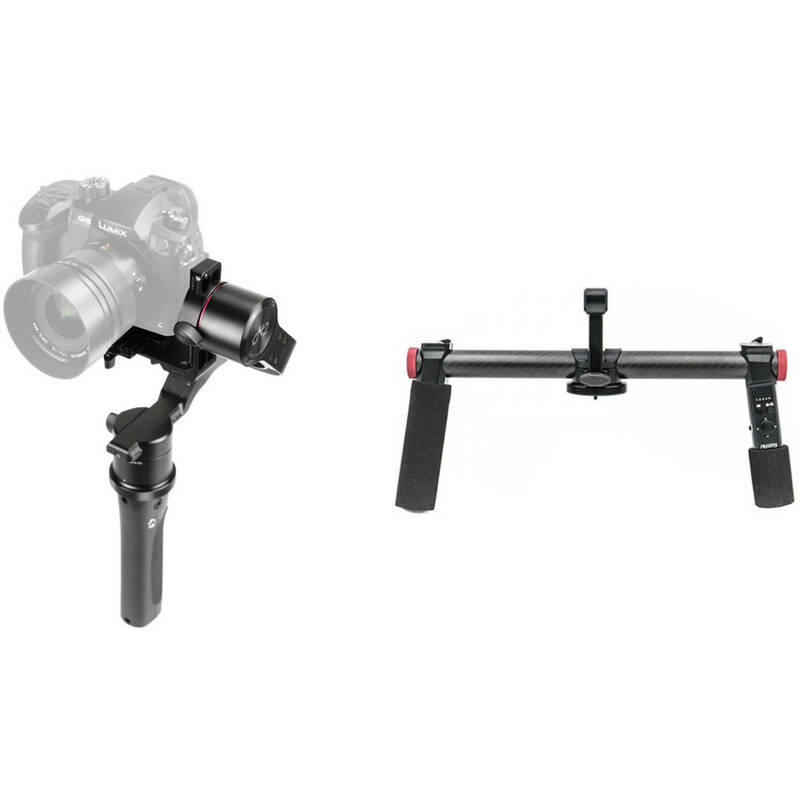 This B&H Kit features the Pilotfly H2-45 3-Axis Handheld Gimbal and a dedicated 2-Hand Holder (Version 3) with Bluetooth-enabled controls. The Pilotfly H2-45 supports up to 4.85 lb cameras and works for up to 26 hours on the included battery. With both the gimbal and holder featuring built-in Bluetooth, you're able to operate the pitch and yaw axes of the gimbal without any wires between the two items. The H2-45 3-Axis Handheld Gimbal from Pilotfly features a distinctive design that shifts the roll axis 45° downward keeping the gimbal node out of the way of your camera's display. This three-axis gimbal is designed for a DSLR or mirrorless camera, boasting a payload capacity of up to 4.85 lb. The included handgrip features a 4-way joystick for controlling camera movement and integrates a battery lasting up to 26 hours. Three 1/4"-20 sockets mean not only is it great handheld, you can mount the gimbal on pretty much anything you could mount the camera itself on: sliders, extension poles, jibs, and more. The Pilotfly Two-Hand Holder allows two-hand control with the Pilotfly H2-45 and T1 gimbal stabilizers. Made of carbon fiber and CNC Machined aluminum, and weighing just 1 lb, the Two-Hand Holder is a lightweight addition that provides a four-way joystick for better control of pitch and yaw axes. The Two-Hand Holder attaches to your gimbal quickly without any tools, and operates wirelessly over Bluetooth 4.0. It's powered by four included batteries that insert into an integrated compartment, and comes with a four-bay charger for the batteries. The Two-Hand Holder also features a top handle with a 1/4"-20 threaded mounting hole where you can additionally attach a monitor or mic. Box Dimensions (LxWxH) 17.0 x 9.2 x 3.6"
Box Dimensions (LxWxH) 14.75 x 8.0 x 4.5"